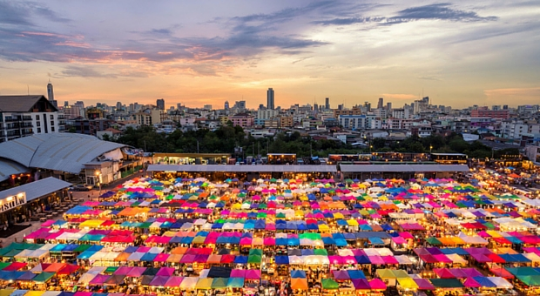 The most striking place of the city of Bangkok is definitely the massive market that occupies the Northern part of the city, Chatuchak Market, divided into 27 sections, open exclusively during weekends and hosting more than 15.000 stands. Chatuchak Market was originally created between the 40s and the 50s, and owes its birth to marshal Plaek Phibunsongkhram, former Prime Minister of Thailand, who first gave start to the project of building flea markets spread across the capital. However, only in 1982 it was decided to establish one of them, nowadays known as Chatuchak Market, in the area of Phahonyothin, nearby the Chatuchak Park – after which the market was named. Having visited Thailand when I was only 9 years old, coming in touch with such a different reality from the Western one I was raised in represented an unforgettable experience I still remember vividly today. Therefore, the idea of market I was used to was turned upside down pretty quickly: apart from selling classical market items, in Chatuchak Market it is possible to find animals of any species, the most colorful clothes, without mentioning handmade products such as soaps, fragrances, scented oils, toys for kids, mesmerizing bags of hemp and, needless to say, gorgeous jewelry. Local food is prepared and cooked in stands right in front of customers, who are hence wound by a spiced aroma that is mixed together with the scent of artisanal perfumes – it is thus advised to try some Thai specialties, which range from the famous Pad Thai to fried bugs for the bravest tourists. Stalls in Chatuchak Market are not only destined to sell items and animals, but also to offer services that in Western countries would be particularly expensive and not affordable by everyone, such as massages and hair braiding. Hence, while walking down the market streets, one could see stands functioning as roofless barbershops, revolutionizing the concept of privacy of many tourists. Another aspect unfamiliar with our reality is represented by the importance given to talismans and amulets, including pendants and small statues of Buddhist divinities. Each of them hides a special meaning, usually explained and attentively examined with lenses by the monks who are selling them. With a 30% of foreigners, most of the visitors are consequently locals, and together amount to approximately 200.000 visitors on both Saturdays and Sundays – is not so hard to imagine how chaotic and busy the market can get, and naturally how frequent robbery is. In addition, not much differently from every other flea market in the world, it is possible to buy fakes foreigners often mistake as originals; also, bargaining is always recommended in order not to overpay for low-quality items, especially when handmade. Despite such ordinary recommendations that one should be aware of when visiting a tumultuous city like Bangkok, Chatuchak Market is provided with an efficient security system which also includes policemen on motorbikes, contributing to create a tourist-friendly environment that nevertheless sinks its roots deeply into the Thai core of the capital.